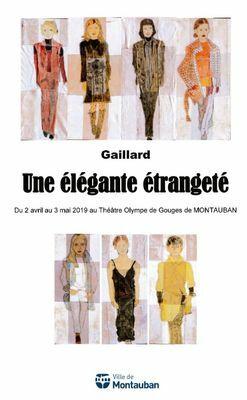 An exhibition of Philippe Gaillard on haute couture (2006-2007 season) presented from Tuesday, April 2 to Thursday, May 2, 2019 at the theater Olympe Gouges in Montauban. The exhibition "An elegant strangeness" The exhibition consists of some thirty paintings painted in oil, made as part of the personal activities of Philippe Gaillard. The artist for these used the technique of paper mounted on canvas encased on wood. The works presented are inspired by fashion shows of the period 2006-2007. The painted characters give the impression of scrolling. Their clothes, of different colors and styles, are the creation of a single designer. These paintings have never been shown in France. On the other hand, they were exhibited in Mexico City from November 2006 to February 2007 as part of the programming of the Mexico City Cultural Center under the auspices of the French Embassy in Mexico. The artist Philippe Gaillard Philippe Gaillard was born in 1951 in Montauban. Internationally renowned painter, artist and writer, he has regularly exhibited since 1970 in galleries, salons and unusual places (cathedral, chapel of the hospital, house of agriculture, Prefecture of Montauban, Council of Europe ...). As a philosopher and writer, he has published 14 books. His approach of visual artists is to create his frames from planks of recovery, tissues that he assembles by sewing them to make the canvas on which he sticks papers whose motives or writings are part of the work. He also creates totems, heads in sculpture. He discusses various topics that he deals with as series such as bullfighting, rugby, fashion, bouquets, landscapes ... He says of his work: "My art belongs rather to a figurative representation and a representative figuration , so it immediately resembles the figurative ". Distinguished in many salons, her paintings are present in several public and private collections in France and abroad.